What’s going to happen at fresh meat training? We are going to safely teach you how to play the game of roller derby. Our training is broken up into three sections – Basic Skating Skills, Contact, and Game Skills – each focusing on the necessary skills to progress to the next level. You will be assessed (see more about assessments below) after each section to ensure that you are safe enough to move on. Below is detailed information about each section. 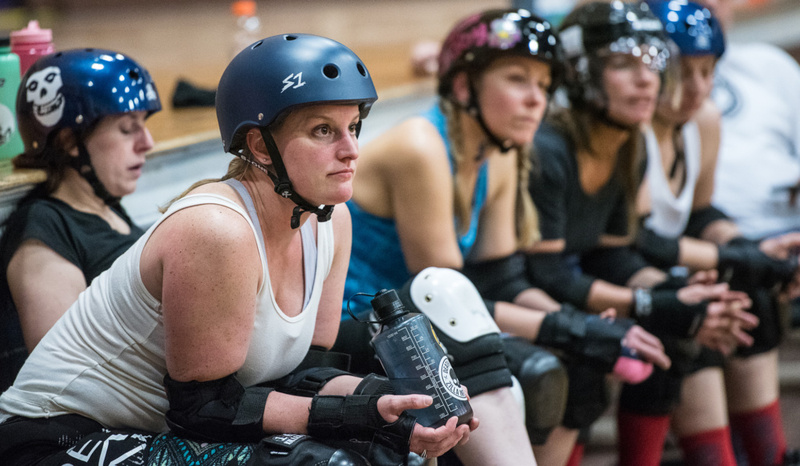 Developing a foundation of good derby habits is a skater’s best chance of being successful in the sport. Basic training focuses on derby form, balance, footwork, speed control, and awareness. A skater must develop these skills in order to safely and smoothly progress to learning contact and how to play the game of roller derby. Skaters learn how to perform the previous skills within tight spaces, so they can feel comfortable skating in a pack. Skaters also learn how to give assists (whips and pushes) and how to block. We focus on safety and legality to help skaters build a solid foundation of derby skills. Skaters are introduced to new skills, practice with a partner, and then practice in a pack to simulate the feeling of actual game play. This is the most exciting level because you learn how to play the game of roller derby! You will learn about game rules and how they impact your decisions, you will learn how to use all your good derby skills, and you will learn how to be a good teammate! Safety is our number one priority. We believe that most injuries happen within a skater’s first year and they can be avoided with proper training. We hold assessments to make sure a skater has the skills necessary to move forward with training. For example, she must develop the proper balance and footwork and strength before moving on to contact or she could get injured. Similarly, a skater must spend significant time learning how to block (contact) before she can learn how to play the game. 1. Attendance. We expect you to attend every practice of the training program. The program is highly concentrated, so if you miss a practice, you will miss a lot. In order for you to successfully graduate, you need to develop all the skills you learn in practice. If you absolutely must miss a practice, we ask that you reach out to the coaches/trainers personally to find out what you missed and how you can make it up. 2. Be on time! We expect you to be ready to go at the start time of each practice. Arrive at least 15 minutes early to gear up, so you are on the track when practice begins. 3. Prepare for practice. We want you to be mentally and physically engaged during practice, so make sure you are hydrated and have eaten well. If you’ve had a rough day, before you arrive at practice take 5-10 minutes to yourself. Breathe slowly and visualize yourself skating and being fully engaged. If you need help with suggestions for how to better prepare for practice, please reach out – we want to help! 4. Focus during practice. Be fully engaged during practice. Listen, ask questions, take notes. Pay attention to your coaches and do your best to execute their instructions. Learning something new is hard and can be frustrating, but it’s important that you learn how to minimize frustration. Focus on getting out of your comfort zone. Focus on pushing your physical boundaries. Be okay with failing. It will happen a lot. That’s what practice is for! 5. Respect our practice space. We view practice time as a sacred learning space and respect it as such. Respect our coaches by listening attentively and never talking over them. When the drill has ended, look to your coaches for the next instructions. You will have time to chat before and after practice and all week long. 6. Pay attention to your body. If you haven’t played sports before, this will probably be a time when you learn the difference between good pain and bad pain. (If this is something you would like more information about, please let us know!) Only you know when something hurts and if more activity could be dangerous. We want you to learn and to push yourself, but not to the point of injury. It is never worth it! We encourage skaters to remove themselves from a drill if they feel they are going to injure themselves. We also encourage skaters to seek medical attention for an injury and to strictly follow to their doctor’s orders. 7. Reflection and Retention. We want you to retain the information you learned at each practice. We encourage you to, on your drive home, visualize and review what you learned at practice. We also encourage taking notes during and after practice to help retain that information. Before the next practice, read through your notes and/or visualize and review what you learned at the previous practice. Between practices, if you are able, work on the skills you learned to help develop that good muscle memory! 8. Cross training. In order to see improvement and to get results in your training, you need to train outside of practice. 9. Educate yourself! We highly encourage supplementing your derby training with derby workshops and camps. There are many derby resources and we want you to use them! We’ll notify you of these opportunities.